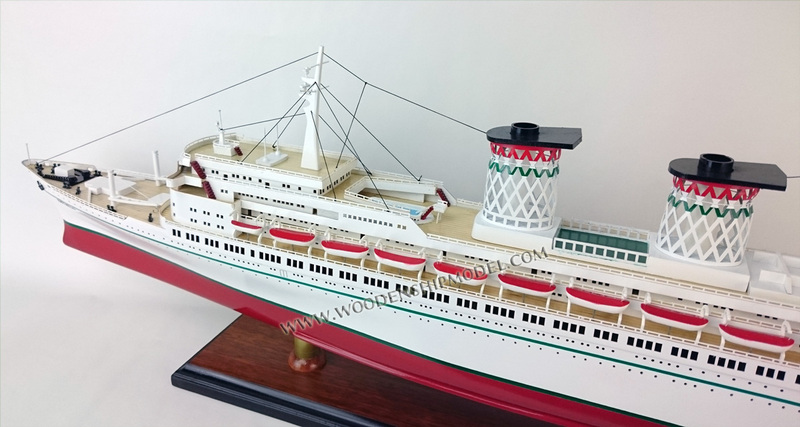 SS Raffaello was an Italian ocean liner built in the early 1960s for Italian Line by the Cantieri Riuniti dell'Adriatico, Trieste. She was one of the last ships to be built primarily for liner service across the North Atlantic. Her sister ship was the SS Michelangelo. 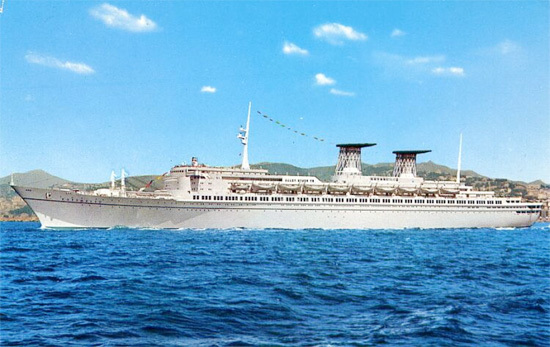 In 1958, the Italian Line began planning new ships to replace the ageing MS Saturnia and MS Vulcania. Competition from jet airliners had not yet had a huge impact in the Mediterranean area and jobs were needed for Italian sailors and shipyard workers, so constructing new superliners seemed like an attractive idea to Italian Line executives. Consequently, the new ships grew from the originally planned 35,000 tons to nearly 46,000 tons. They were the largest ships built in Italy since SS Rex and SS Conte di Savoia in the 1930s. Unable to foresee the change that lay ahead for the shipping business, the Italian Line planned the ships as true ocean liners, divided into three classes. Little thought was given to cruising as an alternative use. Oddly even for a liner, all cabins below A-deck were windowless. But on the technical side the ships were among the most advanced of their time. They featured retractable stabiliser wings, highly modernised engineering panels, and many other advantages. The funnels, in particular, were specially designed to keep smoke and soot from the rear decks. The funnel design proved to be highly effective, and it is a testament to their design that most funnels in modern passenger ships are built along similar principles. The new ships' interiors were in the Art Deco style so often associated with liners. The Raffaello's interiors were designed by architects such as Michele and Giancarlo Busiri Vici, who had not worked on liner interiors before. As a result, the Raffaello gained highly futuristic, more distinctive, but more sterile interiors than her sister. Despite being planned as identical sisters, the Raffaello was 0.7 meters (2.3 feet) shorter, 0.40 meters (1.3 feet) wider, and some 22 tons larger than her sister. It took five years to finish the Raffaello, a long time even by the standards of the day. The ship was further delayed when stern vibrations were discovered during the first sea trials. The ship's propellers and transmission system were modified to eliminate the vibrations. 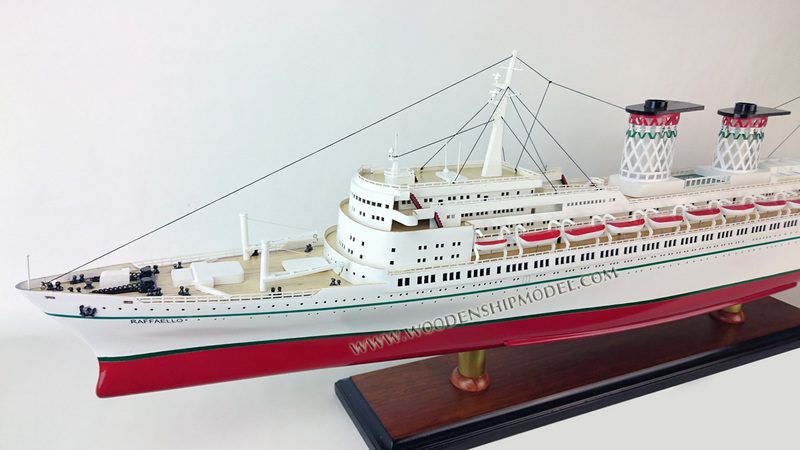 The modifications were successful and the ship was finally ready for service in July 1965. Senior Captain Oscar Ribari commanded her on the maiden voyage. The passengers included Italian Senate-president Cesare Merzagora and his wife, the ship's godmother. In 1966 the Raffaello hosted two unusual passengers for an ocean liner: she carried two Spider 1600 cars bound for exhibition in the United States. 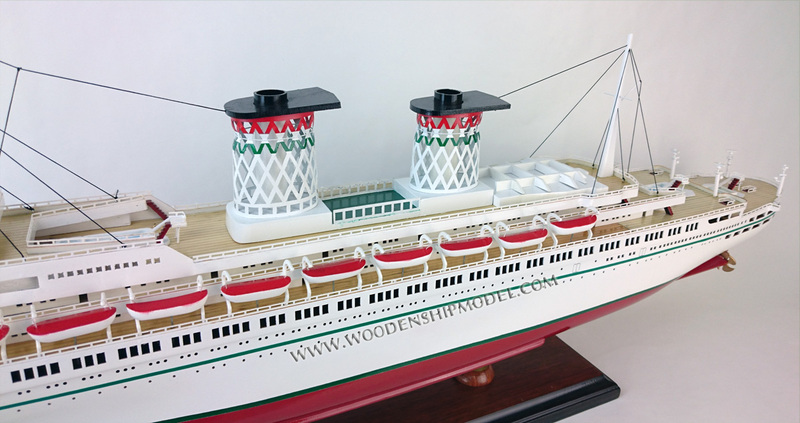 The cars were even driven on the ship's first-class lido decks, a first for an ocean liner. 1969 saw Raffaello perform in the Italian film Amore mio aiutami, made in part to promote the two ships (despite the film officially being set on board the Raffaello, it was filmed on board both ships). In 1970 Raffaello became the first ship whose theatre stage was converted into a skating rink and skating shows were performed for passengers. In 1970 the ship suffered the most serious accident of her career when, under command of Senior Captain Luigi Oneto, she collided with a Norwegian oil tanker off the south coast of Spain in May 1970. No lives were lost. Although Raffaello was the larger of the two sisters, and her interiors more distinctive, she was always the less important sister in the eyes of Italian Line executives. As a result, when the transatlantic traffic started declining due to competition from air traffic, the Raffaello was sent cruising in order to make more money while the Michelangelo kept doing crossings. But she was not very well suited for cruising. Although she did have a large amount of open deck space, she was too large, her cabins too small, and most of them too spartan for demanding cruise passengers. The Italian Line decided to withdraw the Raffaello in April 1975, after the Italian Government announced that it would not further subsidize the ship (by 1975, it was paying 100 million lire per day, or about $151,500 at the then current exchange rate, to keep it sailing). Initially laid up in Genoa and later in La Spezia near the scrapyard, the Raffaello and her sister (which joined her in July of the same year), were inspected by several potential buyers such as Norwegian Cruise Line, Costa Amatori, Chandris Group, and Home Lines. The last even made a serious offer to buy the ships, despite large rebuilding costs, but the Italia Line rejected the offer. In 1976 the Shah of Iran emerged as a buyer the Italian Line could accept. The former flagships of Italy that had cost a total of $90 million in 1965, were sold for $4 million a decade later. Raffaello made her final journey late in the same year from La Spezia into Bushehr, where she served as floating barracks for the next seven years. In 1978 plans emerged to resurrect the Michelangelo and Raffaello as cruise ships. The Raffaello would have become Ciro il Grande (named after ancient Achaemenid ruler Cyrus the Great), a luxury cruiser accommodating 1300 passengers. But Italian specialists sent to evaluate the ships' condition realised the ships were too decrepit to make reconstruction financially viable. As a result Raffaello stayed in her moorings. She was heavily damaged and looted during the Islamic revolution in 1979. 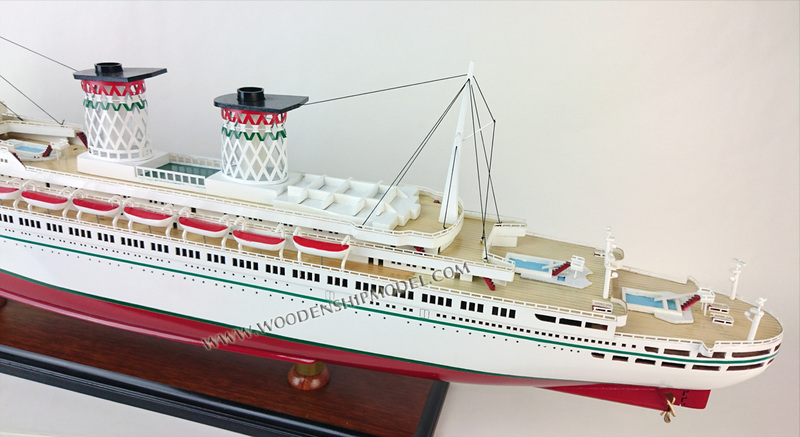 In 1983 plans were again made to bring the sisters back into service as cruise ships. But the Raffaello had been hit by a torpedo during the Iraq-Iran War in 1983 and partially sank in shallow waters outside Bushehr. Some time later her wreck was rammed by an Iranian cargo ship. Local divers further looted the hull in subsequent years. As of 2006, the Raffaello's hull remained partially submerged, and there have been reports of plans to scrap her. One source indicates that she is not visible from the surface, but her position (28°49′0.24″N 50°52′36.58″E) is marked by warning buoys.